The idea that robots are taking jobs that used to go to human beings isn’t just science fiction these days. It is a real thing that seems to be on everyone’s mind. Quantic Dream’s new android based release Detroit: Become Human deals with just that phenomenon. 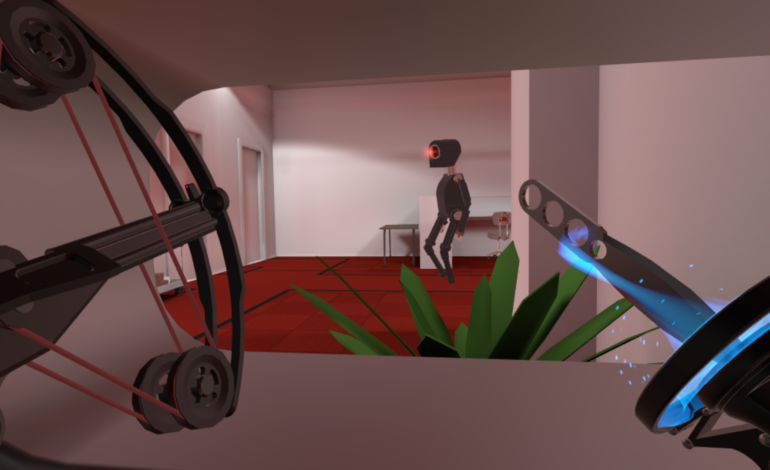 But an upcoming VR title from Neat Corporation takes a slightly different approach to the idea. In Budget Cuts, you are a low level employee at TransCorp, who spends most of their time doing busywork. Unfortunately, TransCorp is looking to cut costs, and that means replacing you with a robot who can do the job. As your coworkers start to disappear, a package dropped off at your desk might just tell you how to save your job. The game is all about stealth. Keep your head down and creep between the cubicles to keep yourself from getting dragged off to HR to be replaced. Use what you can find around the office to sneak up behind the robots and disable them before they can find you. The gameplay takes the jumpy movement that VR tends to use, but gives it an update. As you think about jumping to a new spot, you’ll be able to see ahead and peek around corners to look at what you might be getting yourself into. The graphics, while cartoony, look great, and since the game is being built natively for VR, the controls should be well tailored to the experience. If you’re interested in trying it out, there is a pre-alpha demo available on Steam and Viveport right now. It came out early last year, so it might not be an exact look at what is to come, but you can get an early idea ahead of this week’s release. After some delays earlier this month, the game will finally be releasing May 31. Budget Cuts will be available on Steam and Viveport for the HTC Vive and will be available on the Oculus Rift store as well.